1. Marinate tenderloin beef, calamansi juice, salt,pepper, soy sauce. Pan-grill until done, and set aside. 2. Sauté in sauce pot with oil, garlic, onion ring until translucent. Add liquid coffee and the remaining marinade liquid. Allow to boil. Thicken with slurry corn starch. Season to taste. 3. 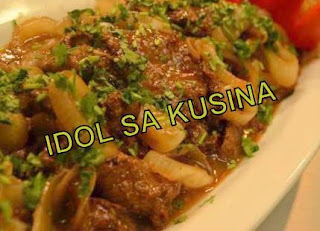 Place on plate Bistek Tagalog over the top with sautéed onion rings and the sauce. Garnish with roughly cut cilantro.